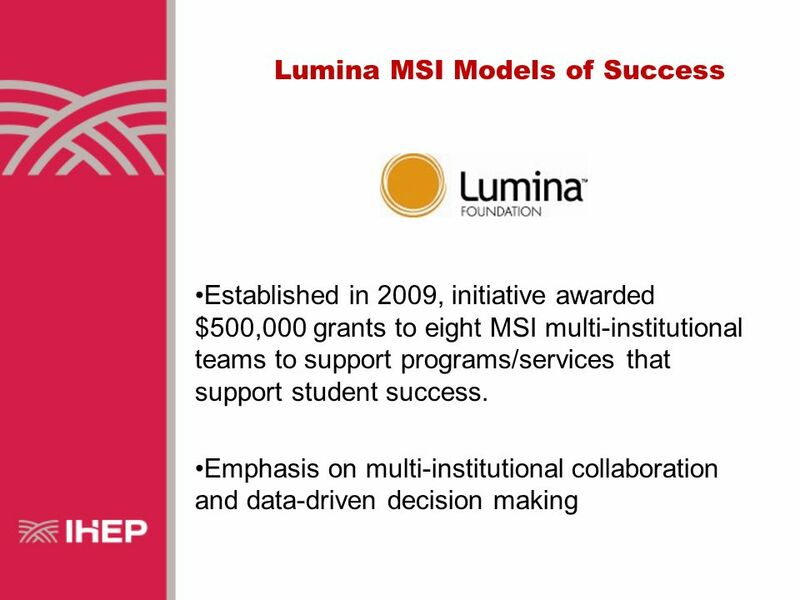 Lumina MSI Models of Success Noël Harmon, Ph.D., Senior Research Analyst, Institute for Higher Education Policy and Becky Rosenberg, Ph.D. Director, Center. 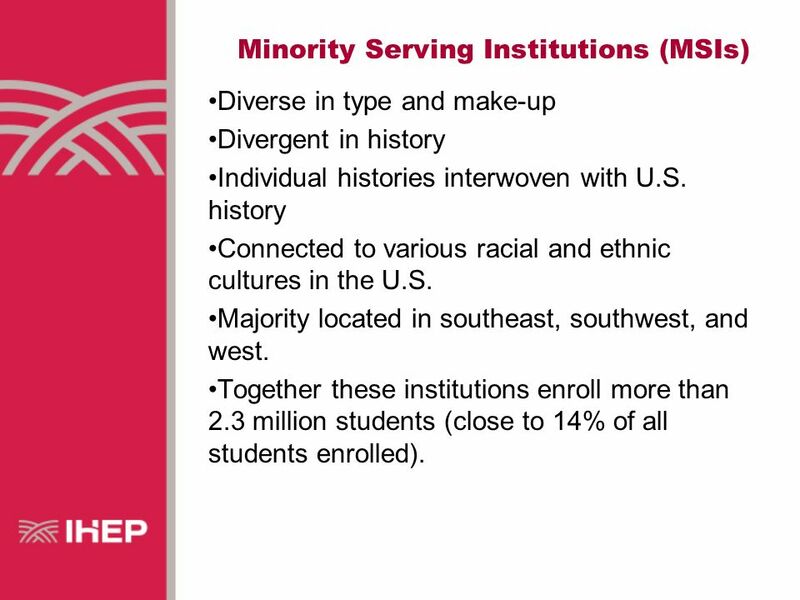 5 Minority Serving Institutions (MSIs) Diverse in type and make-up Divergent in history Individual histories interwoven with U.S. history Connected to various racial and ethnic cultures in the U.S. Majority located in southeast, southwest, and west. 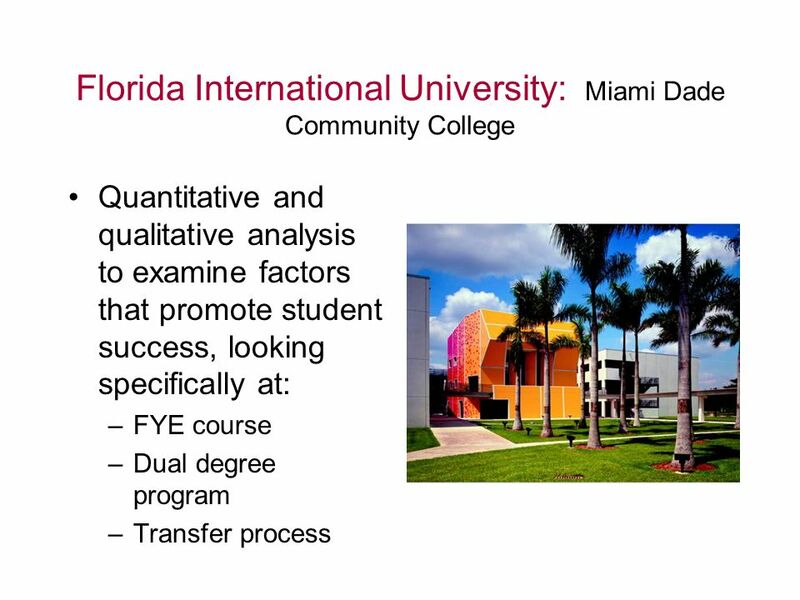 Together these institutions enroll more than 2.3 million students (close to 14% of all students enrolled). 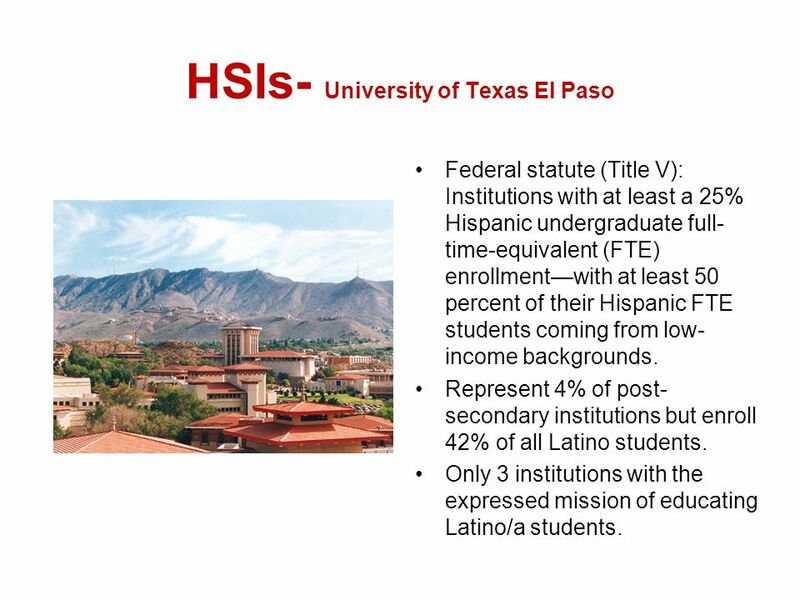 7 HSIs- University of Texas El Paso Federal statute (Title V): Institutions with at least a 25% Hispanic undergraduate full- time-equivalent (FTE) enrollmentwith at least 50 percent of their Hispanic FTE students coming from low- income backgrounds. 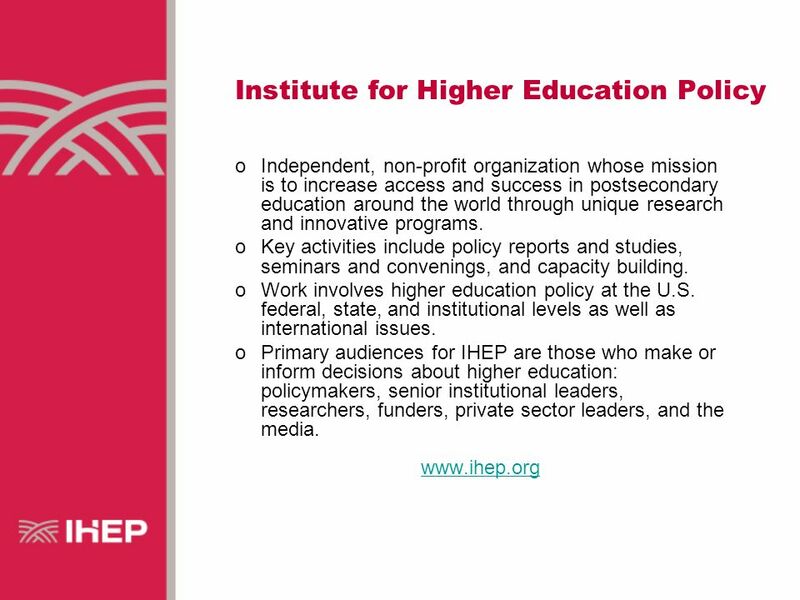 Represent 4% of post- secondary institutions but enroll 42% of all Latino students. 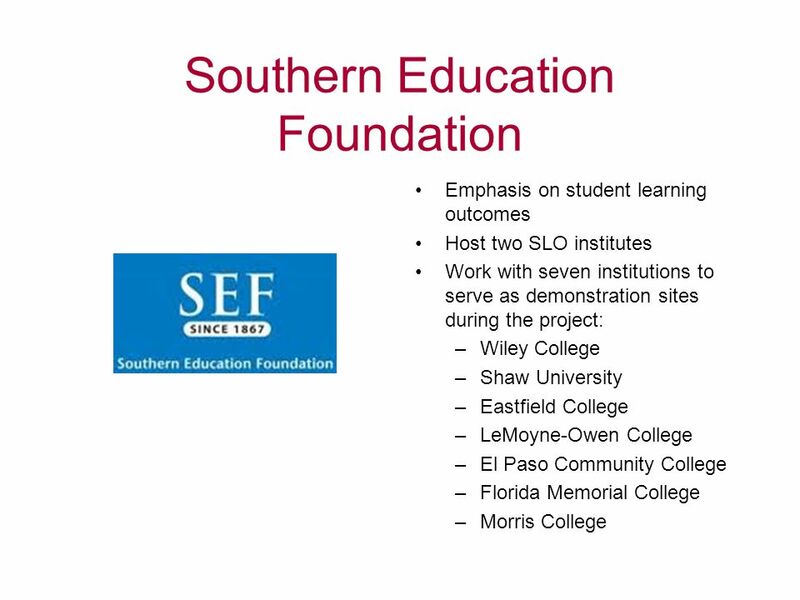 Only 3 institutions with the expressed mission of educating Latino/a students. 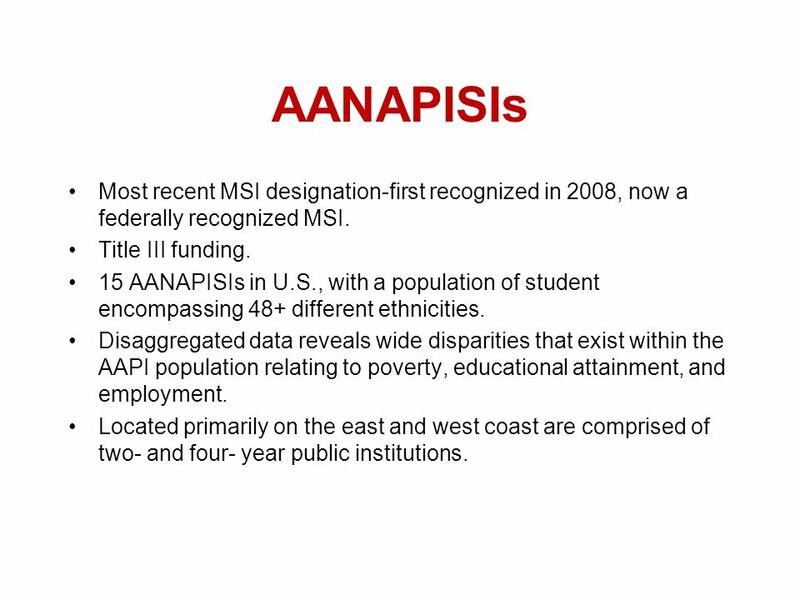 11 AANAPISIs Most recent MSI designation-first recognized in 2008, now a federally recognized MSI. 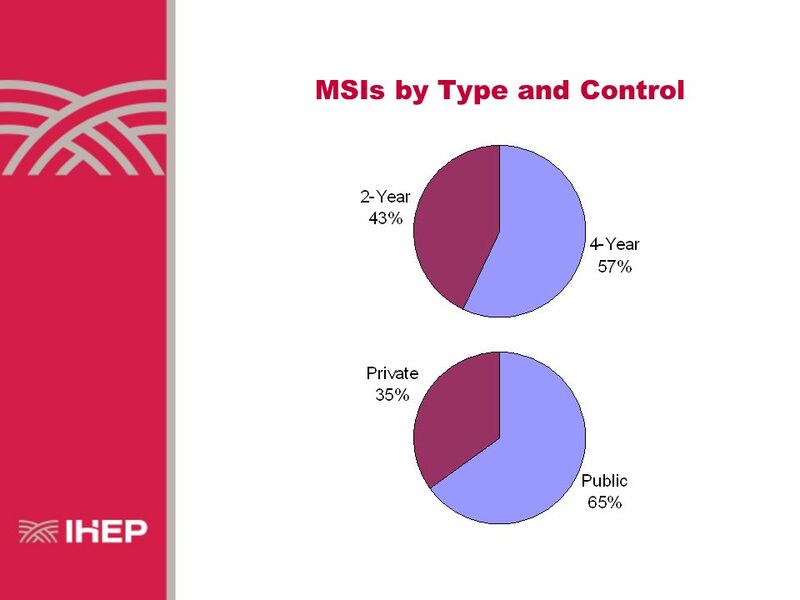 Title III funding. 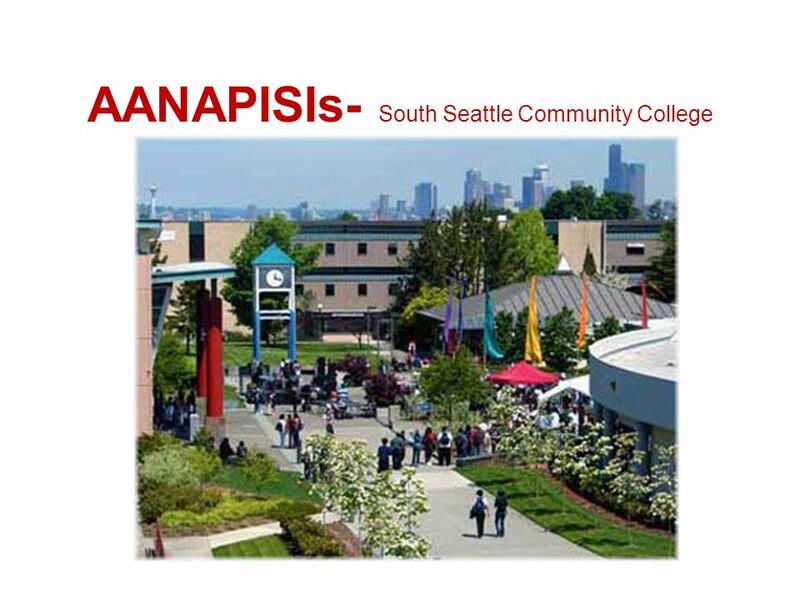 15 AANAPISIs in U.S., with a population of student encompassing 48+ different ethnicities. 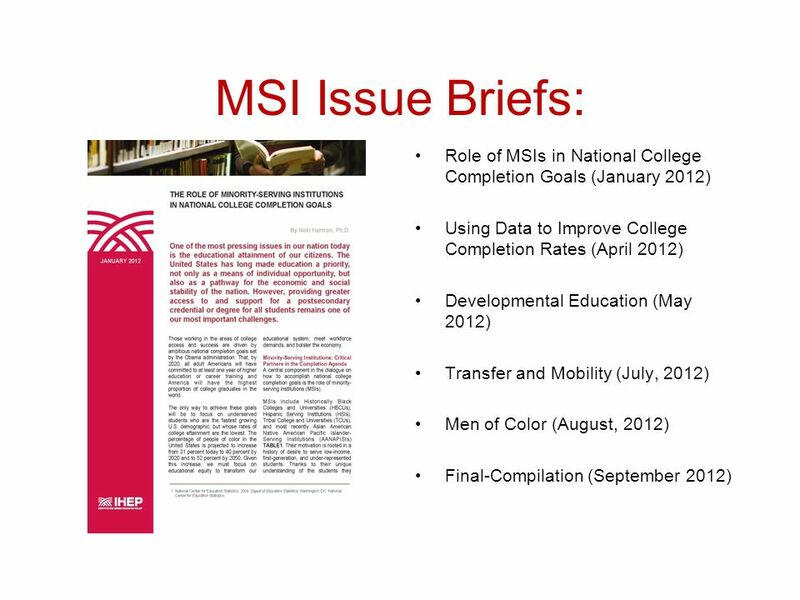 Disaggregated data reveals wide disparities that exist within the AAPI population relating to poverty, educational attainment, and employment. 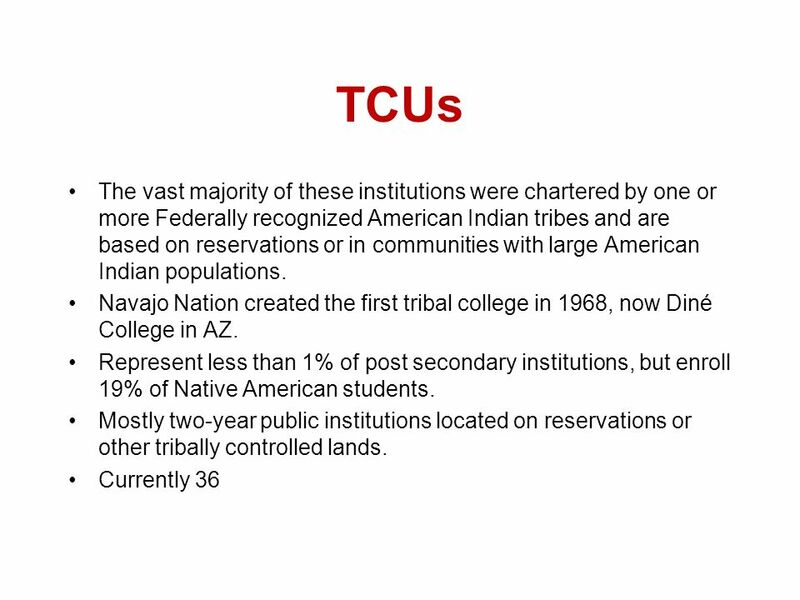 Located primarily on the east and west coast are comprised of two- and four- year public institutions. 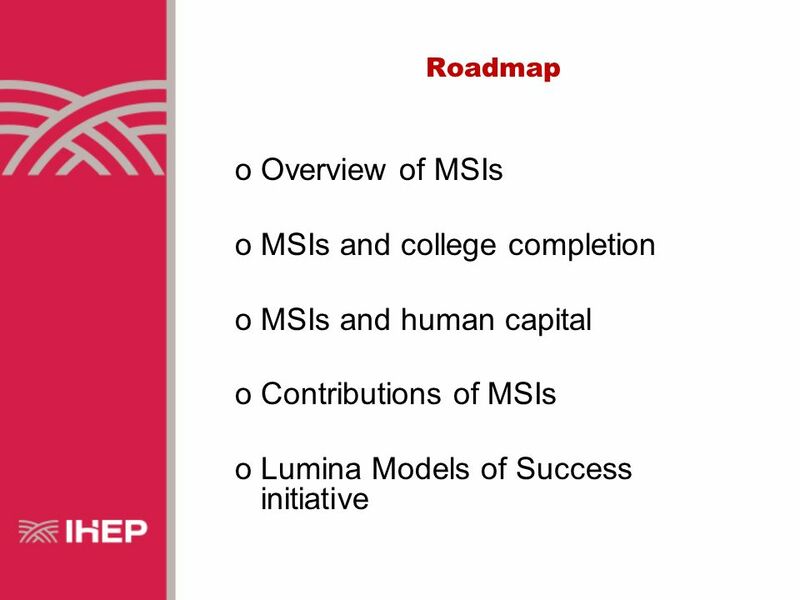 13 MSIs and college completion goals One the most pressing issues in our nation today is the educational attainment of its citizens. 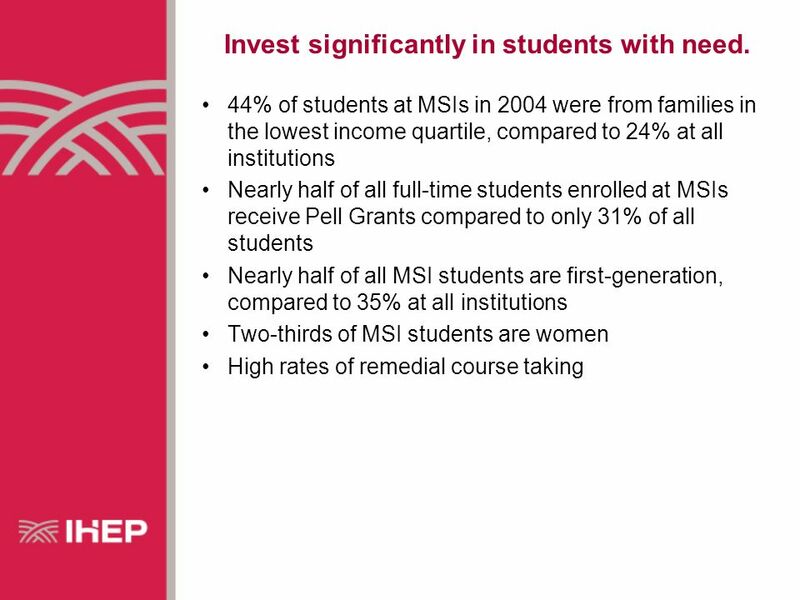 Achievement gap between students of color and their White counterparts persists and continues to grow. 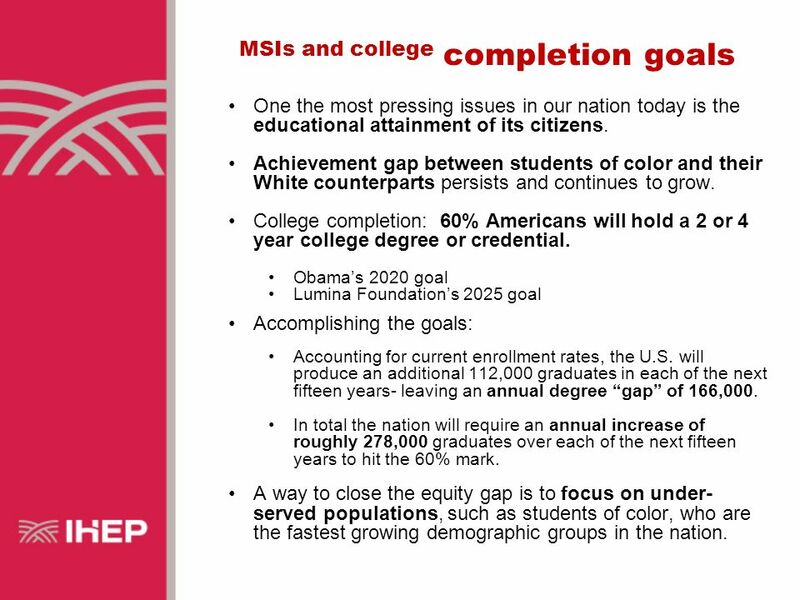 College completion: 60% Americans will hold a 2 or 4 year college degree or credential. 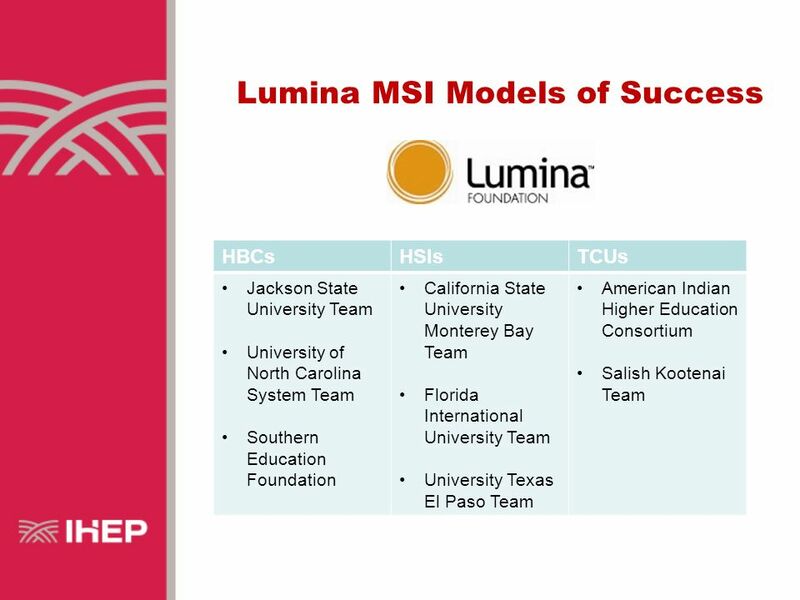 Obamas 2020 goal Lumina Foundations 2025 goal Accomplishing the goals: Accounting for current enrollment rates, the U.S. will produce an additional 112,000 graduates in each of the next fifteen years- leaving an annual degree gap of 166,000. 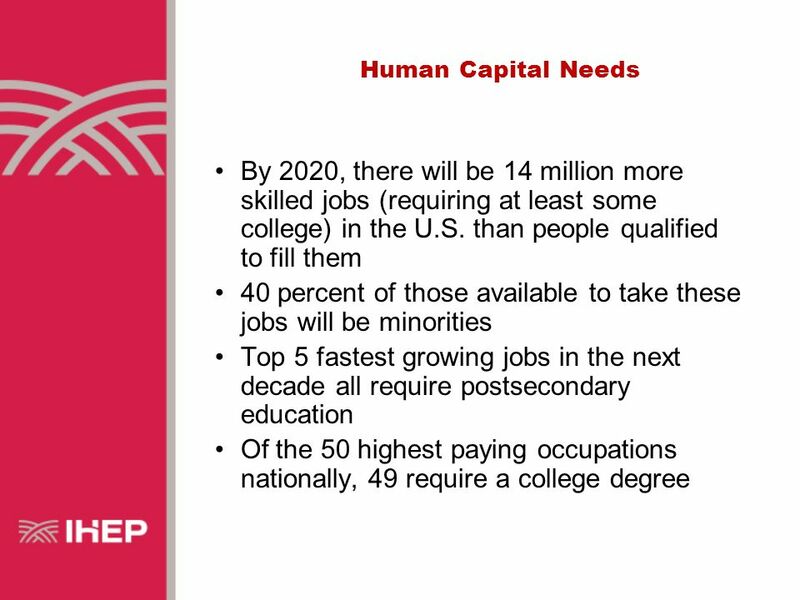 In total the nation will require an annual increase of roughly 278,000 graduates over each of the next fifteen years to hit the 60% mark. 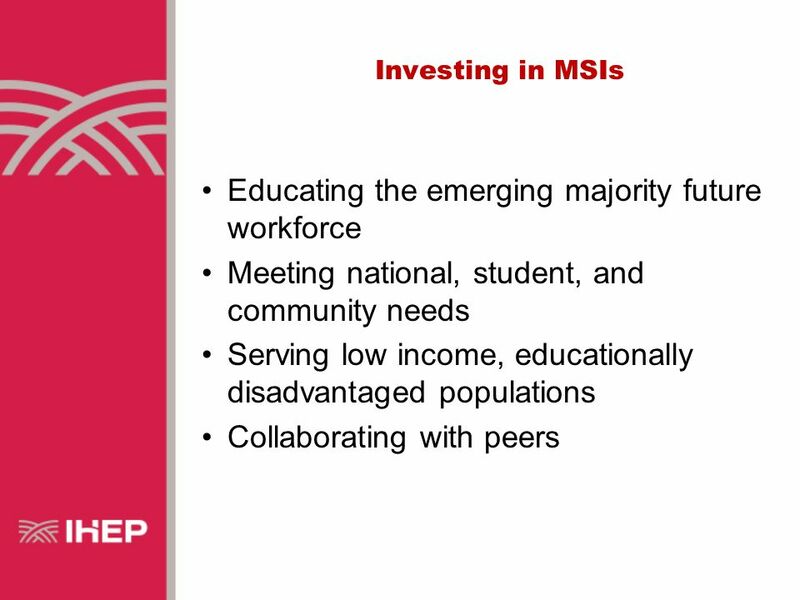 A way to close the equity gap is to focus on under- served populations, such as students of color, who are the fastest growing demographic groups in the nation. 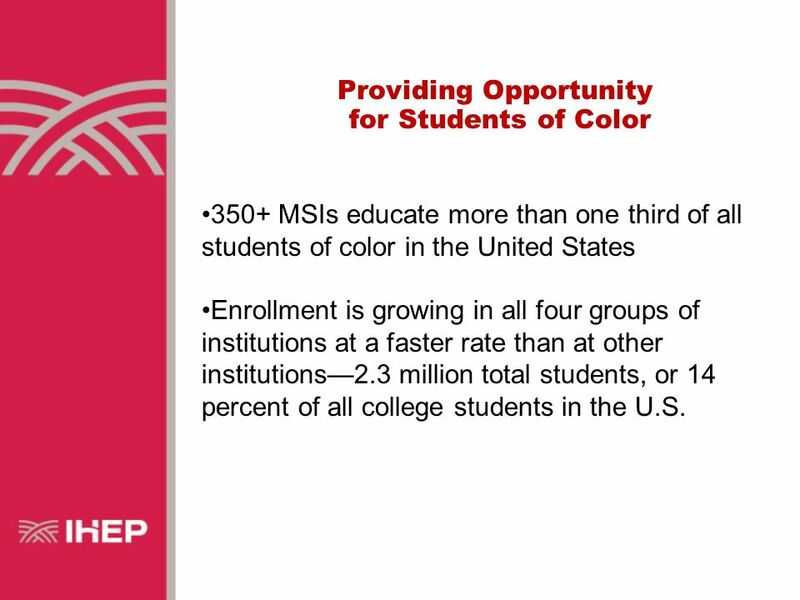 15 Providing Opportunity for Students of Color 350+ MSIs educate more than one third of all students of color in the United States Enrollment is growing in all four groups of institutions at a faster rate than at other institutions2.3 million total students, or 14 percent of all college students in the U.S.
16 Amy Stiffarm- descendant from the Gro-Ventre, Cree, and Blackfeet tribes, Salish Kootenai College During her first year she became interested in American Indian health issues, diabetes and heart disease which impact her family and community. She has been a student intern in the Cellular and Molecular Biology Lab, presented her research at numerous conferences including the 2009 Society Advancing Chicanos/Hispanics and Native Americans in Science (SACNAS) conference, where she won a Poster Presentation Award for her research about the presence of Methicillin- Resistant Staphylococcus Aureaus (MRSA) on Seattle beaches. 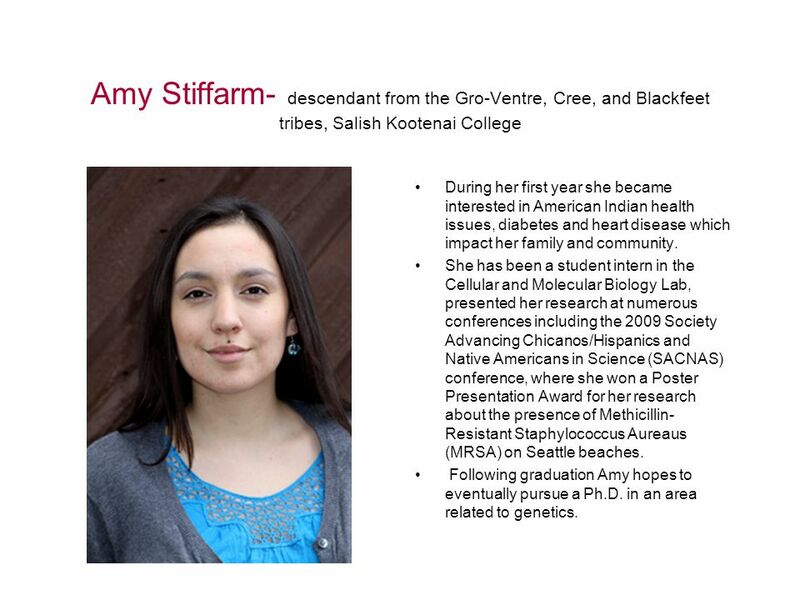 Following graduation Amy hopes to eventually pursue a Ph.D. in an area related to genetics. 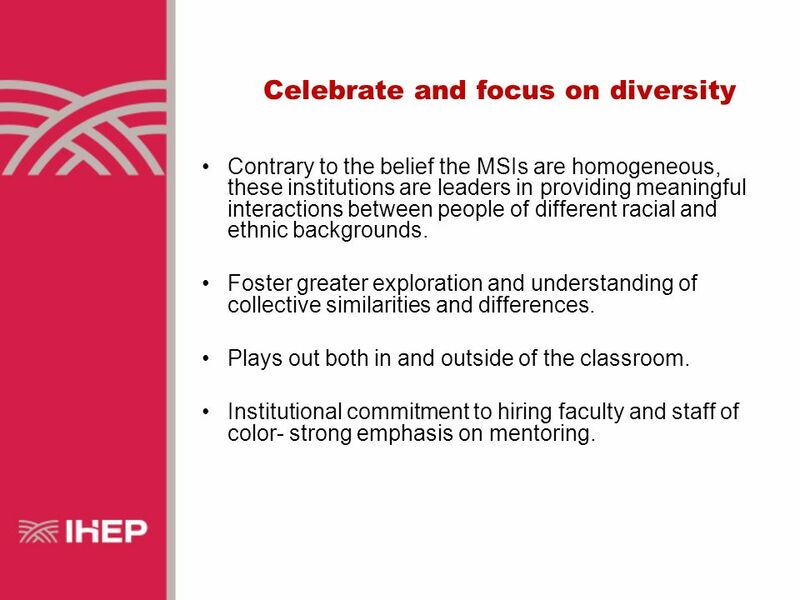 18 Celebrate and focus on diversity Contrary to the belief the MSIs are homogeneous, these institutions are leaders in providing meaningful interactions between people of different racial and ethnic backgrounds. 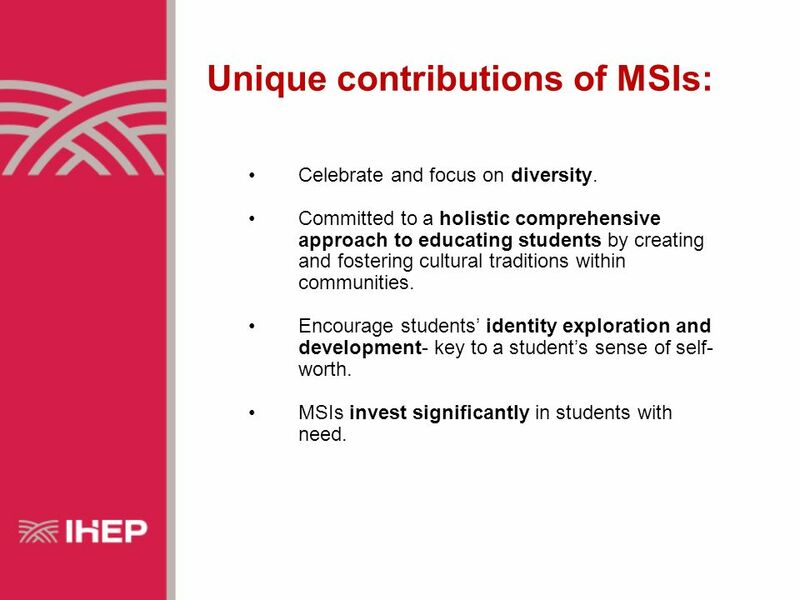 Foster greater exploration and understanding of collective similarities and differences. Plays out both in and outside of the classroom. 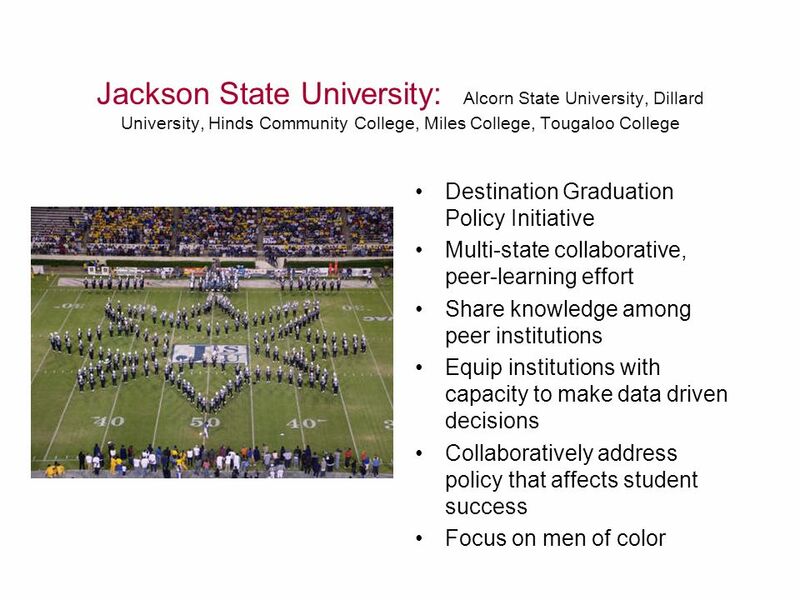 Institutional commitment to hiring faculty and staff of color- strong emphasis on mentoring. 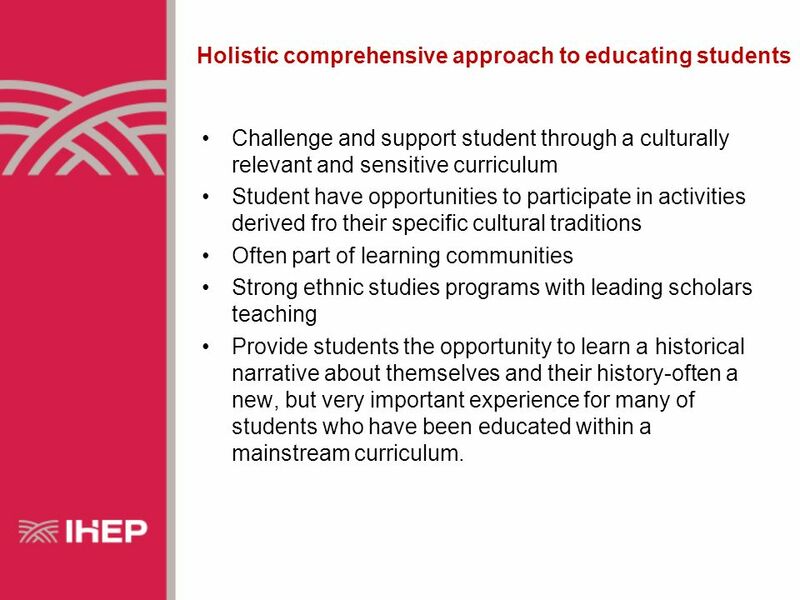 19 Holistic comprehensive approach to educating students Challenge and support student through a culturally relevant and sensitive curriculum Student have opportunities to participate in activities derived fro their specific cultural traditions Often part of learning communities Strong ethnic studies programs with leading scholars teaching Provide students the opportunity to learn a historical narrative about themselves and their history-often a new, but very important experience for many of students who have been educated within a mainstream curriculum. 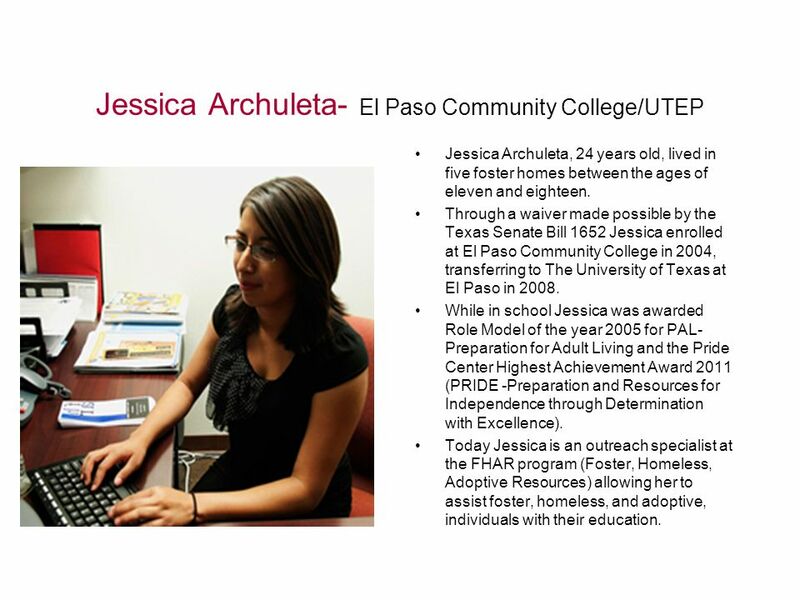 22 Jessica Archuleta- El Paso Community College/UTEP Jessica Archuleta, 24 years old, lived in five foster homes between the ages of eleven and eighteen. 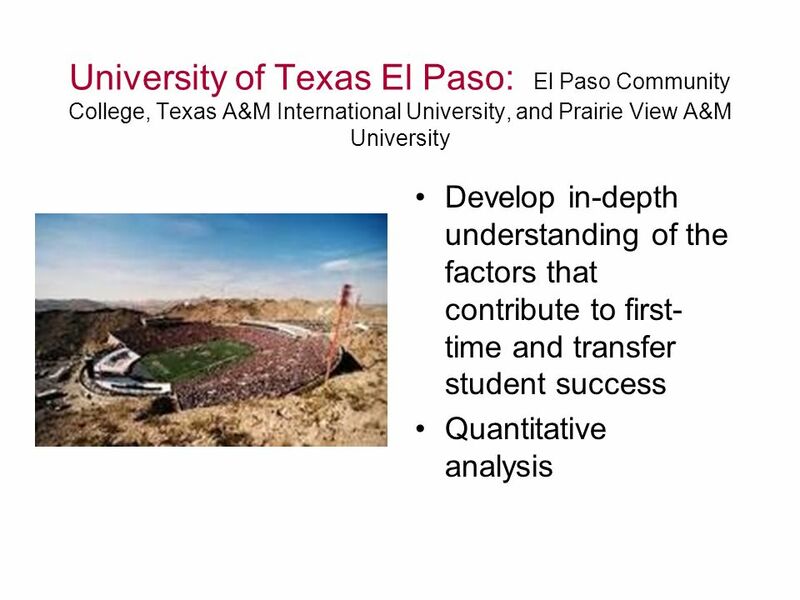 Through a waiver made possible by the Texas Senate Bill 1652 Jessica enrolled at El Paso Community College in 2004, transferring to The University of Texas at El Paso in 2008. While in school Jessica was awarded Role Model of the year 2005 for PAL- Preparation for Adult Living and the Pride Center Highest Achievement Award 2011 (PRIDE -Preparation and Resources for Independence through Determination with Excellence). 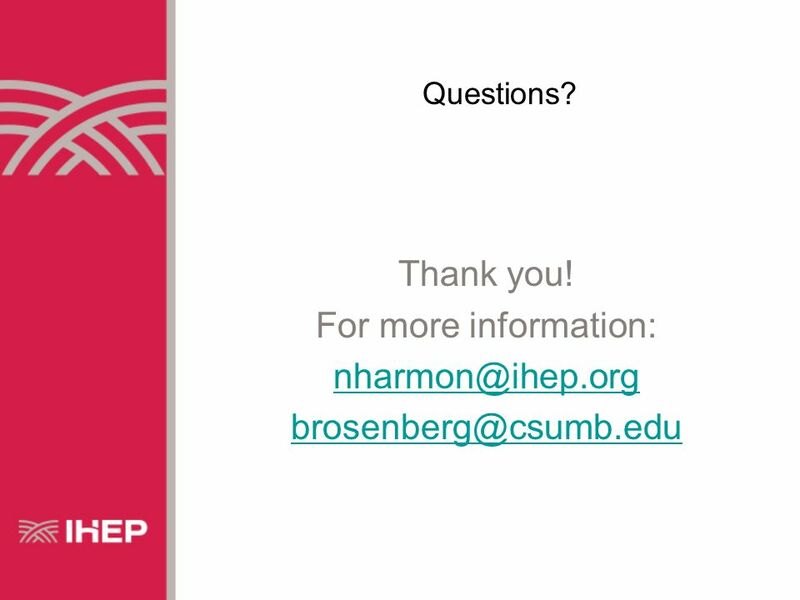 Today Jessica is an outreach specialist at the FHAR program (Foster, Homeless, Adoptive Resources) allowing her to assist foster, homeless, and adoptive, individuals with their education. 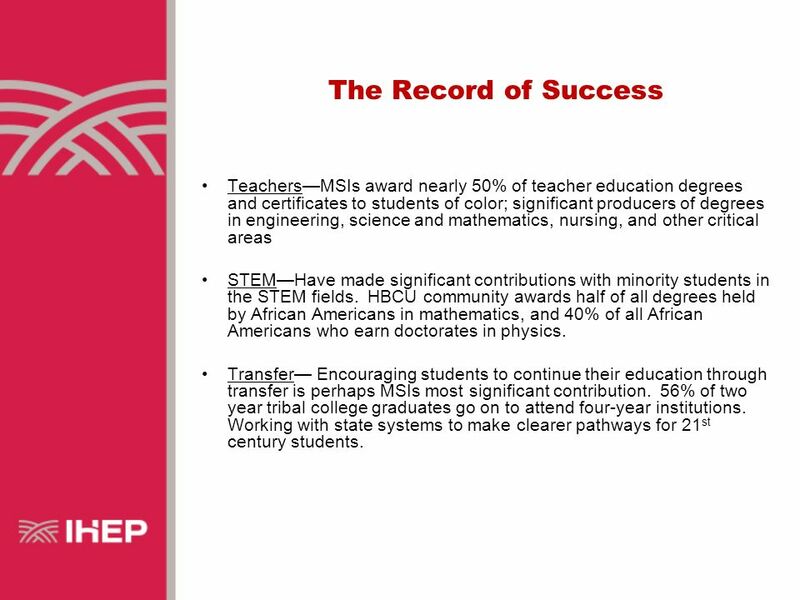 24 The Record of Success TeachersMSIs award nearly 50% of teacher education degrees and certificates to students of color; significant producers of degrees in engineering, science and mathematics, nursing, and other critical areas STEMHave made significant contributions with minority students in the STEM fields. 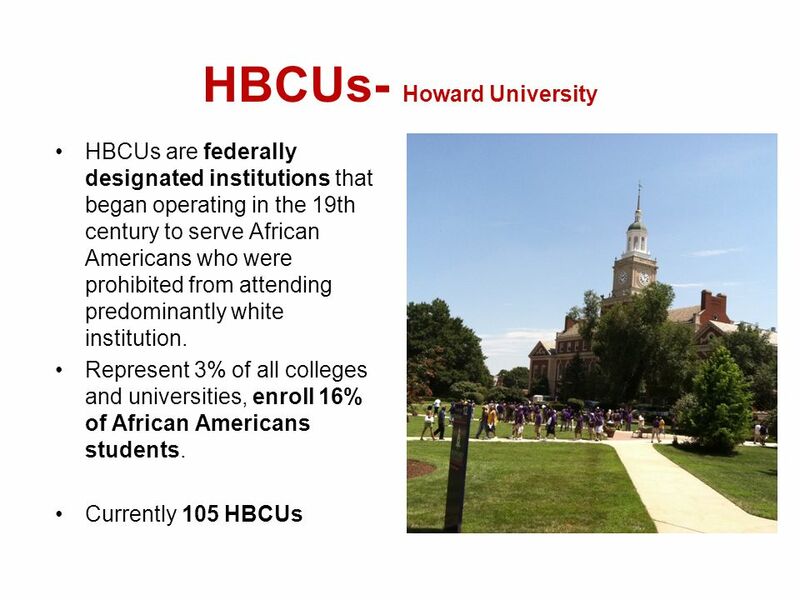 HBCU community awards half of all degrees held by African Americans in mathematics, and 40% of all African Americans who earn doctorates in physics. 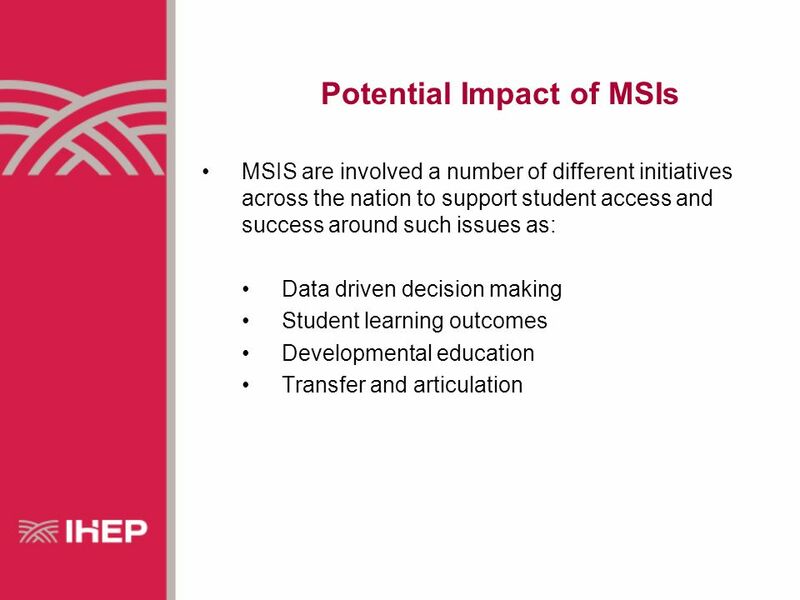 Transfer Encouraging students to continue their education through transfer is perhaps MSIs most significant contribution. 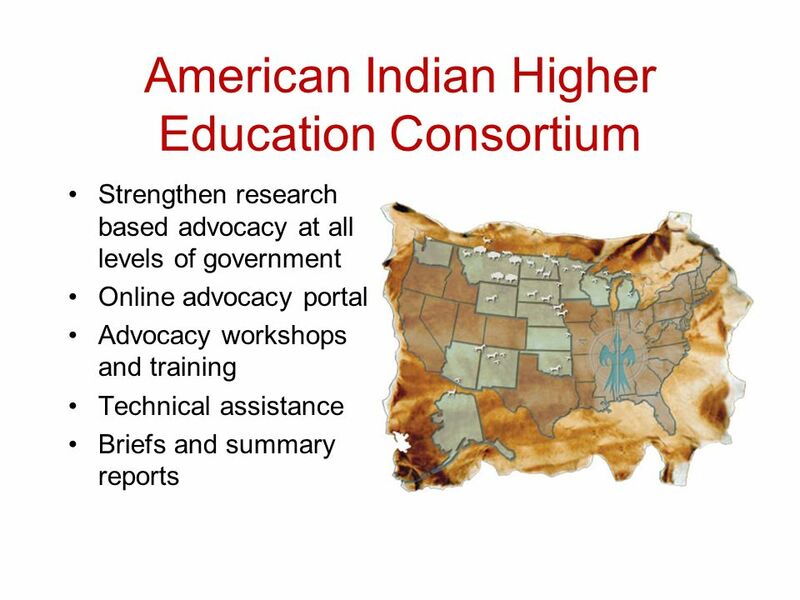 56% of two year tribal college graduates go on to attend four-year institutions. 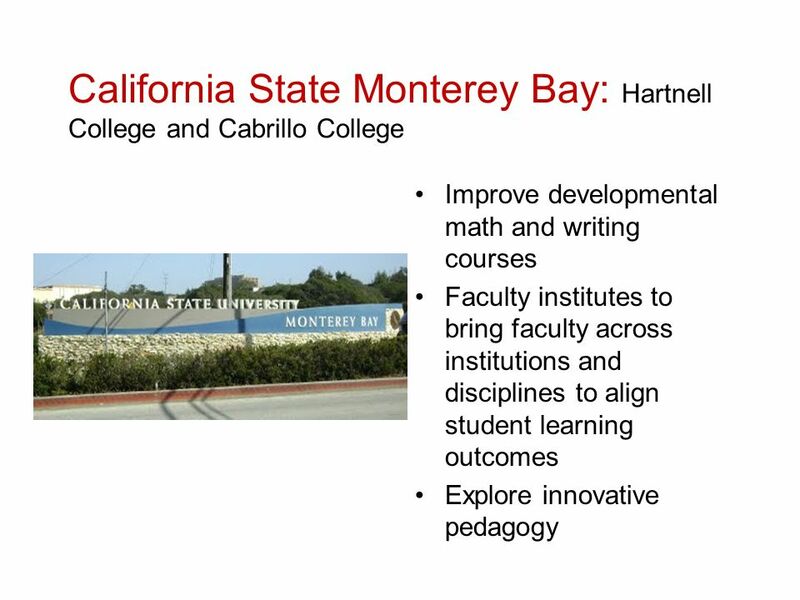 Working with state systems to make clearer pathways for 21 st century students. 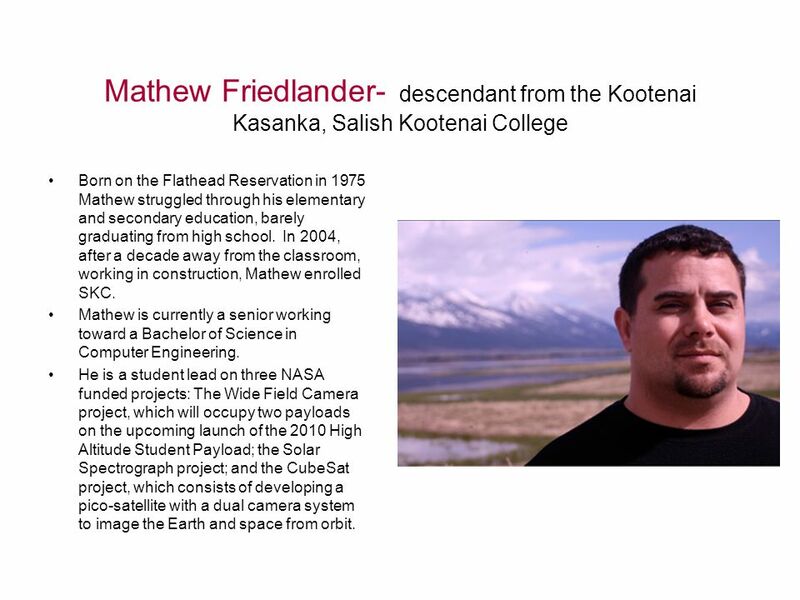 25 Mathew Friedlander- descendant from the Kootenai Kasanka, Salish Kootenai College Born on the Flathead Reservation in 1975 Mathew struggled through his elementary and secondary education, barely graduating from high school. 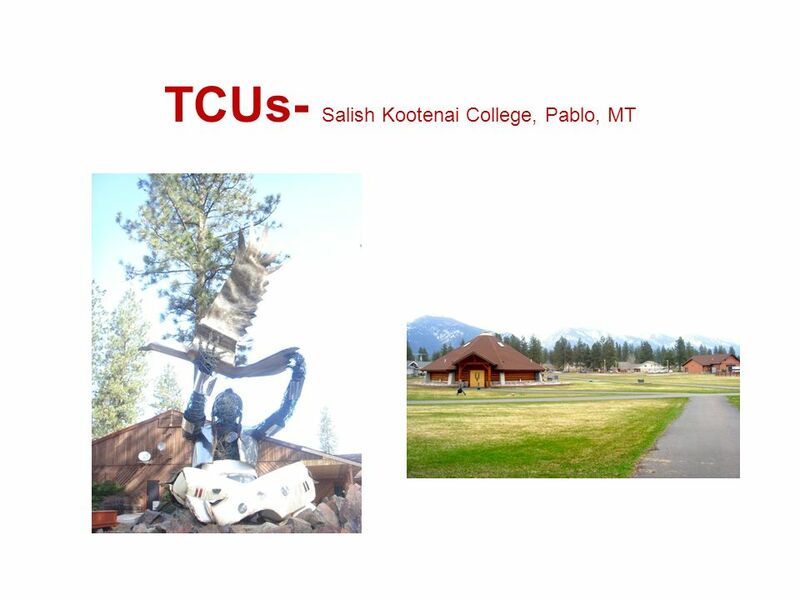 In 2004, after a decade away from the classroom, working in construction, Mathew enrolled SKC. Mathew is currently a senior working toward a Bachelor of Science in Computer Engineering. He is a student lead on three NASA funded projects: The Wide Field Camera project, which will occupy two payloads on the upcoming launch of the 2010 High Altitude Student Payload; the Solar Spectrograph project; and the CubeSat project, which consists of developing a pico-satellite with a dual camera system to image the Earth and space from orbit. 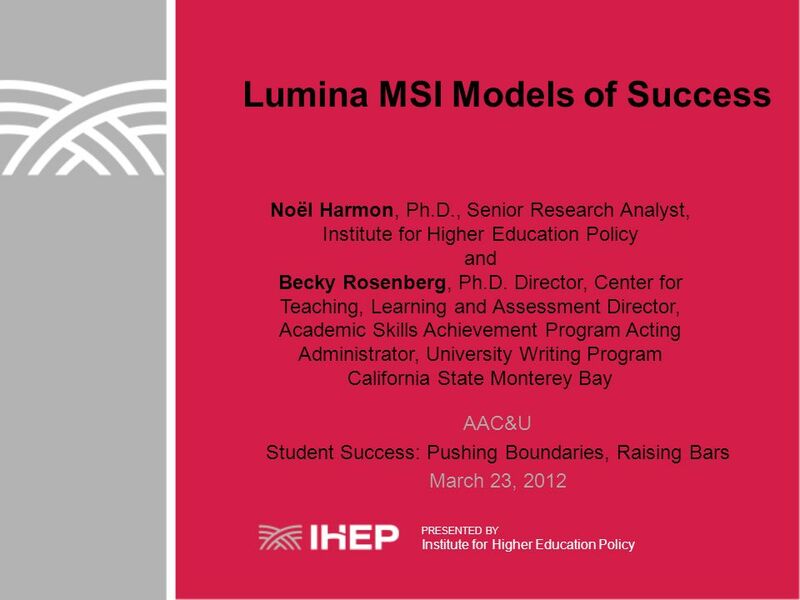 Download ppt "Lumina MSI Models of Success Noël Harmon, Ph.D., Senior Research Analyst, Institute for Higher Education Policy and Becky Rosenberg, Ph.D. Director, Center." 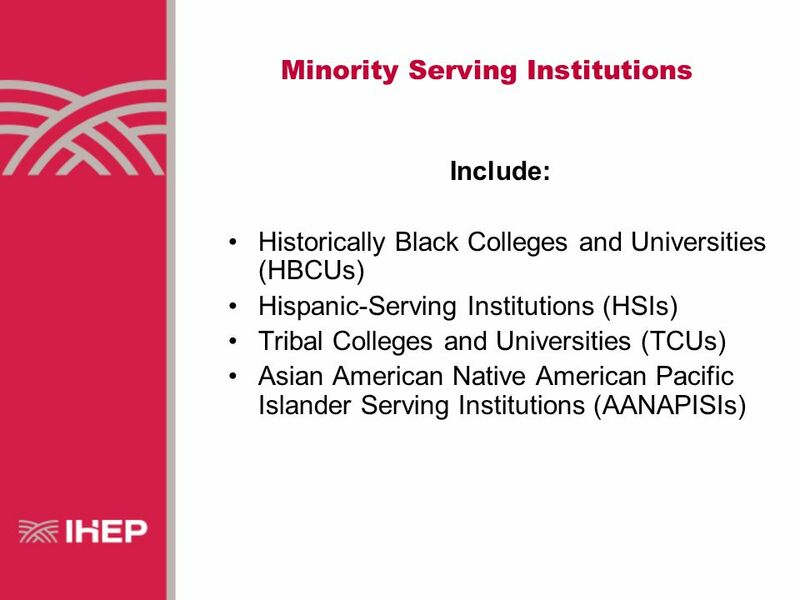 Inventing Hispanic-Serving Institutions (HSIs): The Basics American Youth Policy Forum (AYPF) March 2006 Deborah A. Santiago, PhD. 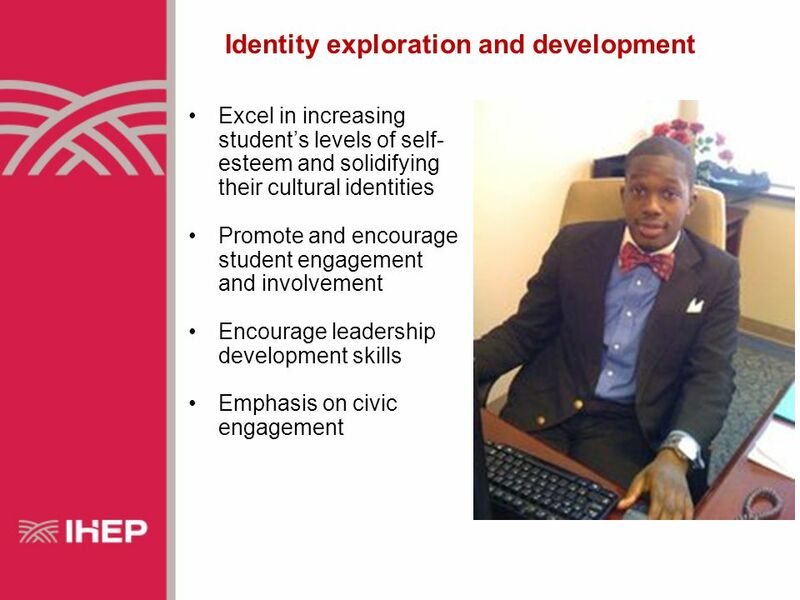 Empowerment Without Boundaries Michelle Asha Cooper, PhD President PRESENTED BY The Institute for Higher Education Policy AAC&U Student. East Bay Conservation Corps Charter School Charter Renewal Presentation OUSD State Administrator Board of Education September 28, 2005.